I received some good news this week, Stephen Hunt, author of one of my favourite series the 'Jackelian' series has released a new book in his 'Sliding Void' Sci-Fi series. 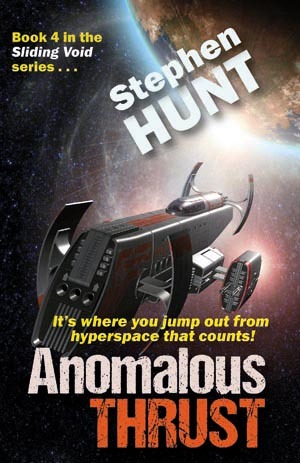 Anomalous Thrust (Sliding Void #4) has now hit the bookshops! I was sent an A.RC. so hope to have it finished and have a review up soon. Anomalous Thrust is the 4th book in Sliding Void series. It's a completely stand-alone adventure, not directly linked to the first three books (although Anomalous Thrust is set chronologically a year after the end of the previous books). It's also full novel-sized, rather than novella-sized.